Chinese birth pig. Unique. In 1984, the French collector from whom I bought it, gound it in Shanghai or Beijing. 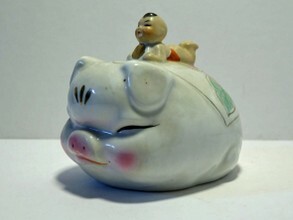 On the pig there is a boy (of course, girls did not count in traditional China and certainly not during the former one child politics. However it remains tradition...). The golden dot indicates prosperity. 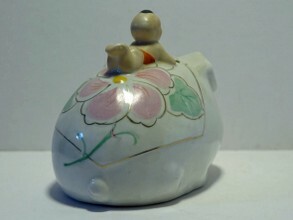 That the child is lying on a pig also brings happiness and the peony roses on the piggy bank confirm that once again.